I woke with a short gasp. I could feel the icy air cut through my fabric barrier of Carhartt, Under Armour, down blankets and sleeping bag. My breath lingered in the air like a puff of smoke as I struggled to sit up on my cot. My body seemed frozen as I fumbled for my phone to see the time. “How could I be cold again?” I thought. It was only 2 AM. Maybe I never really warmed up in the first place. I looked hopelessly at my electric heater that had burned through its battery much faster than I anticipated. The relentless biting of the single digit cold penetrated every layer down to my skin. Combined with the grogginess of waking up at two in the morning, I was starting to feel the toll mentally and emotionally. This was going to be a long trip. Fly fishing is a fun activity that I do not engage in nearly enough, especially in the winter. Fortunately for me, I had the last week of January to scratch that itch. With five days free and clear to focus on practicing my cast and hopefully hooking a few trout, I set my sights on Lake Taneycomo. I planned my trip with the sole purpose of maximizing my time on the water. In order to do this I came up with a less-than-orthodox form of lodging. They say the road to hell is paved with good intentions and my personal hell came when I decided to retrofit one of our company work vans for “trout bumming”. The idea was simple. 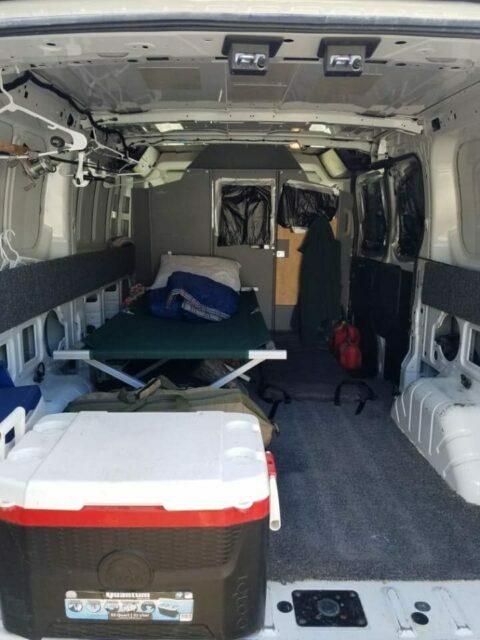 Take one of our Ford Econoline vans, fill it with the necessary gear, and hit the road. I could sleep right at the water’s edge and save money on a hotel. What could go wrong!? Cold. Bone chilling, relentless cold that simply would not let up. I pulled up to outlet one just below Table Rock Dam on my first afternoon. The temperature was in the mid-thirties and it was sunny. Wasting no time, I opened the doors to the back of the van to grab my waders and fly rod. I admired my setup as I opened the doors. My field and stream cot lay in the back corner with my down sleeping bag and two down comforters folded neatly on top. My spinning rods hung on the ceiling of the van over my cot. Under it lay my duffle bag filled with clothes, tackle box and fly rods. To the side, I placed an electric heater hooked up to a Dewalt generator, which was accompanied by my coffee pot. At the base of the cot, I had a cooler and my Fish Pond duffle bag containing my waders and boots. New carpet lay under everything in the van for added insulation. I was all set. I left the river around nine PM after a great day of fishing. 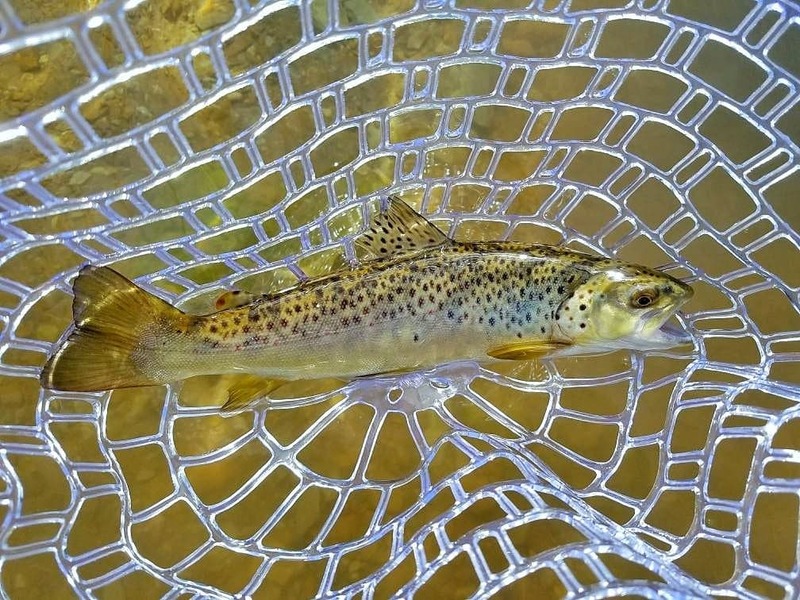 I landed my first ever brown trout and a very pretty 15-inch rainbow. I removed my boots and waders and hung them to dry in the rear of the van with an empty fish cooler to catch the water. I climbed inside and made a pot of coffee. I was pleasantly surprised when the heat from the coffee pot warmed the van nicely. Right away I realized head room was going to be a problem. Everything I did had to be in a weird crouching position or crawling around on my knees. As I prepared for bed, I was fairly certain the heater would die at some point through the night. To combat the inevitability, I pulled a pair of sweatpants and Carhartt pants over my Under Armour long underwear. I stuffed my Carhartt socks with hand warmers, put on a hoodie, and Carhartt jacket. Topping it all off, I wore a rabbit skinned bomber’s cap. I pulled both hoods over and drew the strings tight. I was ready for the night, or so I thought…. After only an hour, the heater died. The cold instantly permeated throughout the van in almost suffocating fashion. 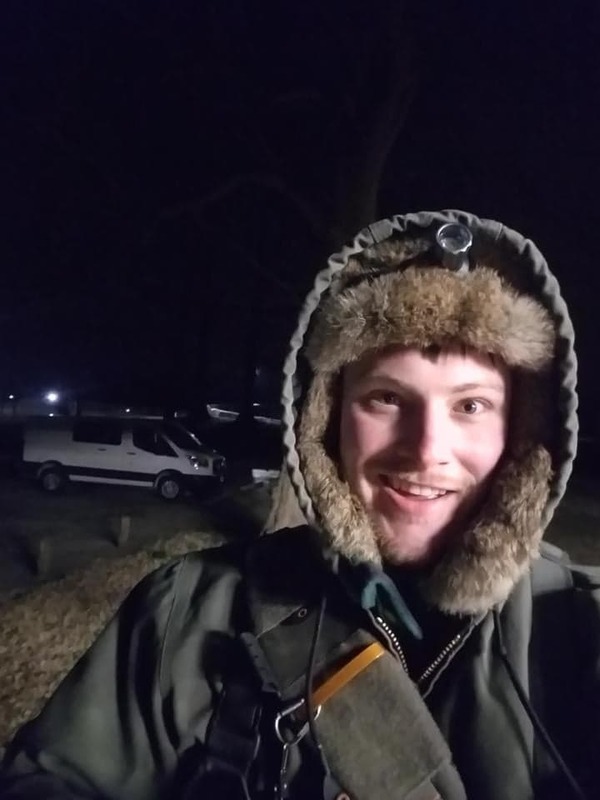 At 9:30 PM, the van was 52 degrees. By 11, it had dropped to 30. I pulled the sleeping bag over my head so that it covered every inch of my body. The cold didn’t care. It pushed deeper into my bones and my mind. When I awoke again at two, the situation had escalated. I heard the plastic on my water bottles popping as they froze. I thought about starting the van, but knew it was no use. There was a divider between the front seats and the cargo area which would stop the heat. I couldn’t remove that barrier easily. I weighed the option of sleeping in the rigid seats of the cab but decided against it. I hunkered in tight and waited it out. Around 5:30, I decided to get up. It was only ten degrees in the van. I tried to brush my teeth, but my toothpaste was like gum. I opened the cooler to grab an apple but it was hard as a rock. My waders hung like cardboard at the foot of my bed. I climbed in the cab and threw my waders on the heater in the dash. Once they were loose enough to wear, I grabbed my gear and walked down to the river. My back, neck and shoulders were in agony from the cold and the low ceiling maneuvers I was forced to perform the night before. Despite my fly rod freezing up a few times, I had a pretty decent morning of fishing. By 11, I was ready to leave and decided to go buy a propane heater for the second night of hell. On the way, I passed Fall Creek Lodge. My subconscious took over as my hands rotated the wheel to turn in. I’ve written this on the second night of my fishing trip, from the comfort of a cozy, queen-sized bed after a hot shower. The afternoon’s fishing success felt even better knowing I would be able to escape the cold at the end. Looking back on the last 24 hours, I’ve been trying to find a take-away from the night’s events. I find myself remembering what the author, Steven Rinella, said after a particularly rough deer hunt in the mountains out west. This quote rings true to me. Luckily I made it through safely, and the amount of laughs and stories I have harvested from that single night was well worth the suffering. Branson, Fishing, Lake Taneycomo, Payden Hays, Trout Fishing. Bookmark.